Rennes Les Bains is small quaint town rich in history, first made popular by the Romans who visited for the healing waters of the hot water mineral baths, rich mineral resources and cooking salts from the springs. Nestled in the foothills of the Pyrenees Mountains the town feels hidden away, in a world of its own. 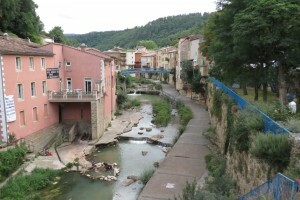 Its beauty is found in all seasons, whether it be walking down the one main tree in the rows of lined sycamore trees, eating lunch in the town center, meditating at The Seat Of Isis, or relaxing at the River Sals in the warm mineral spring bath; Rennes Les Bains is one of the most wonderful flavors of southern France.